With a New Year upon us, I hope each of you start 2015 refreshed from the holidays and ready for an exciting year ahead. While the pace of change is fast, together we can make this year more than days speeding by on the calendar—we can discover and teach, invent and inspire, care and create. I am excited to share several additions to our leadership team. They are all individuals with a deep commitment and passion to serve and to build an environment that enables and empowers our clinicians, researchers, educators, and staff. John Sweeney has been appointed the Joseph Brown Whitehead Chairman of the Department of Surgery and will also serve as director of surgical services, surgeon-in-chief for Emory Healthcare, and chief of the surgery section of the Emory Clinic. He has been serving as interim chair of the department and interim surgeon-in-chief since January 2013. He currently holds the W. Dean Warren Distinguished Chair in Surgery and is chief of the Division of General and Gastrointestinal Surgery and chief quality officer for the Department of Surgery. John brings integrity, positive energy, and a commitment to servant leadership. He has proven to be skilled in building highly effective teams that strive to provide the best possible care, continuously improve, make and translate discoveries, and create an inspiring learning environment. “His record in leading quality and effectiveness research and clinical improvements gives him the experience and expertise to establish and achieve even higher levels of clinical quality and outcomes, effectiveness of surgical services, and optimum utilization of resources in Emory Healthcare,” says John Fox, president and CEO of Emory Healthcare. Since becoming chief quality officer in Emory’s Department of Surgery, he has initiated numerous quality improvement efforts, including participation in the University HealthSystem Consortium Quality and Accountability Program and the Surgical Care Improvement Project. 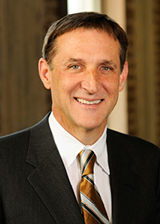 John joined Emory in 2007 from Baylor College of Medicine, where he was chief of the Division of General Surgery and chief of Minimally Invasive Surgery. He received his MD from Rush Medical College. Read more. Kate Heilpern, chair of the Department of Emergency Medicine, has been appointed executive associate dean of faculty affairs and professional development. Kate, who is the Ada Lee and Pete Correll Professor of Emergency Medicine, currently leads emergency and trauma care for five hospitals in metro Atlanta, which combined, see more than 290,000 patients in their emergency departments annually. A graduate of Emory's School of Medicine, Kate returned to Emory in 1996 as assistant dean for medical education and student affairs before becoming department chair in 2007. She has practiced emergency medicine for more than two decades and has a deep commitment to collaboration, open communication, and faculty and leadership development—vital components in upholding our culture and making Emory Medicine a great place to work. Under her leadership, emergency medicine has thrived, becoming one of the largest integrated EM departments in the country, with more than 100 faculty and regularly ranking as one of the top emergency departments for NIH-funded research. Now she also will lead another great team, with Associate Dean of Faculty Affairs Kathy Griendling and Hal Jones, director of care transformation for Emory Healthcare. Kate succeeds Sharon Weiss, associate dean for faculty development since 2006, who was recognized in the fall for her many contributions to SOM-wide initiatives and programs to enhance and support faculty success. Sharon will continue her important work as a surgical pathologist specializing in bone and soft tissue neoplasms, her role as a consulting diagnostician, her research and writing on the features and biomarkers that characterize soft tissue neoplasms, and her mentoring and training of other soft-tissue pathologists. Fadlo Khuri, chair of the Department of Hematology and Medical Oncology and deputy director of the Winship Cancer Institute, will serve as our next executive associate dean of research. Fadlo, who earned his medical degree from Columbia, holds the Roberto C. Goizueta Distinguished Chair for Cancer Research and is editor-in-chief of the journal Cancer. He came to Emory in 2002 from the University of Texas M.D. Anderson Cancer Center. Anyone who knows Fadlo instantly understands his commitment to excellence and academic contribution on a personal and institutional level. He brings passion and joy to the pursuit of translational science. He has an exceptional ability to identify major research opportunities and to identify, support, and enable creative and engaged researchers that cross many disciplines. Ray has been the principal architect of two research strategic plans that propelled Emory into the top tier of academic medical centers. He's an innovative scientist and reseacher in his own right and has been a great leader on an institutional level. He will continue in his roles as chair of the pharmacology department and in helping build our research strategy with David Stephens. We are planning a reception to thank him for his service and to share more about Ray's contributions. Details will be provided soon. Robert Gross, director and cofounder of Emory’s Neuromodulation and Technology Innovation Center, has been appointed director of the NIH-sponsored Medical Scientist Training Program (MSTP), Emory’s MD/PhD program. Bob, who earned his medical degree from Albert Einstein College of Medicine, joined the faculty in 2001 and holds appointments in Emory’s departments of neurosurgery, neurology, and biomedical engineering. His novel approaches have provided new hope for patients with Parkinson’s disease, tremor, dystonia, and epilepsy and have allowed many to resume normal lives. He personifies innovation, collaboration, and mentorship in his work and will bring these attributes to preparing our physician scientists for the future. In closing, I would like to thank John Fox for his 15 years of leadership at Emory and for making Emory Healthcare one of the leading academic health systems in the U.S. As you know, John will be moving to Michigan in March, where he will serve as president and CEO of Beaumont Health, a large, dynamic health care system. With his laser-like focus and commitment to quality and service to patients and families, John leaves Emory well positioned for our next phase of leadership and excellence. We are also fortunate that John has developed an outstanding health care leadership team that is already fully engaged in planning for our future. The collaboration of our outstanding chairs, the health care team, and the new additions to our School of Medicine leadership team will make for an exciting 2015, full of new possibilities.